ORCID number: Hazel Lote (0000-0003-1172-0372); Nicola Valeri (0000-0002-5426-5683); Ian Chau (0000-0003-0286-8703). Author contributions: Lote H wrote the original manuscript and revised it following peer review comments; Valeri N reviewed the manuscript; Chau I reviewed and contributed to the content of the manuscript. Supported by National Health Service funding to the National Institute for Health Research Biomedical Research Centre at the Royal Marsden NHS Foundation Trust and The Institute of Cancer Research, No. A62, No. A100, No. A101 and No. A159; Cancer Research UK funding, No. CEA A18052. Conflict-of-interest statement: No potential conflicts of interest relevant to this article were reported. Human epidermal growth factor receptor 2 (HER2)-inhibition is an important therapeutic strategy in HER2-amplified gastro-oesophageal cancer (GOC). A significant proportion of GOC patients display HER2 amplification, yet HER2 inhibition in these patients has not displayed the success seen in HER2 amplified breast cancer. Much of the current evidence surrounding HER2 has been obtained from studies in breast cancer, and we are only recently beginning to improve our understanding of HER2-amplified GOC. Whilst there are numerous licensed HER2 inhibitors in breast cancer, trastuzumab remains the only licensed HER2 inhibitor for HER2-amplified GOC. Clinical trials investigating lapatinib, trastuzumab emtansine, pertuzumab and MM-111 in GOC have demonstrated disappointing results and have not yet changed the treatment paradigm. Trastuzumab deruxtecan may hold promise and is currently being investigated in phase II trials. HER2 amplified GOC differs from breast cancer due to inherent differences in the HER2 amino-truncation and mutation rate, loss of HER2 expression, alterations in HER2 signalling pathways and differences in insulin-like growth factor-1 receptor and MET expression. Epigenetic alterations involving different microRNA profiles in GOC as compared to breast cancer and intrinsic differences in the immune environment are likely to play a role. The key to effective treatment of HER2 amplified GOC lies in understanding these mechanisms and tailoring HER2 inhibition for GOC patients in order to improve clinical outcomes. Core tip: Human epidermal growth factor receptor 2 (HER2)-inhibition is an important therapeutic strategy in HER2-amplified gastro-oesophageal cancer (GOC). A significant proportion of GOC patients display HER2 amplification, yet HER2 inhibition in these patients has not displayed the success seen in HER2 amplified breast cancer. We evaluate current clinical and laboratory evidence surrounding HER2 inhibition in GOC. Inherent differences in the HER2 receptor, signalling pathways, associated microRNA signature and immune environment may partly explain the disappointing clinical trial outcomes seen in GOC. Only with improved understanding of HER2 inhibition can effective treatment be provided in order to improve clinical outcomes for patients. Cancer therapy is becoming increasingly personalised and molecularly targeted, using biomarkers to identify patients most likely to respond to therapy. Human epidermal growth factor receptor 2 (HER2)-amplified cancer is defined as cancer with HER2 protein overexpression ± HER2 gene amplification. It represents a molecularly-defined subgroup of malignancy and is known to exist in breast and gastro-oesophageal cancers (GOC), among others. Whereas the treatment for HER2-amplified breast cancer patients has been extremely successful, the treatment for GOC has been less so. In this review, we explore the mechanisms by which HER2 amplification contributes to cancer progression and prognosis, methods of targeting HER2 amplification, mechanisms of resistance to HER2 therapy, strategies to overcome resistance, biomarkers and future directions. HER2, encoded by the ERBB2 oncogene on chromosome 17q21, is a member of the epidermal growth factor receptor (EGFR) family associated with tumour cell proliferation, apoptosis, adhesion, migration and differentiation. All studies investigating HER2 receptor interactions have been conducted in breast cancer cells, and a literature search did not reveal any studies of HER2 receptor interactions conducted specifically in GOC. Given the relatively disappointing results seen in GOC, we suggest it may be worthwhile exploring HER2 receptor interactions specifically in GOC, to investigate whether there are any mechanistic differences in HER2 binding and signalling between breast and GOC. In both breast cancer and GOC, HER2 overexpression occurs in approximately 20%[4,5]. The Gastric Cancer Genome Atlas [part of The Cancer Genome Atlas (TCGA)] recently classified gastric cancer into four subtypes and found that HER2 overexpression occurs only in Epstein-Barr virus (EBV)-positive tumours, genomically-stable (GS) tumours and tumours with chromosomal instability (CIN) but not in microsatellite unstable (MSI-high) tumours. Mechanisms by which HER2 overexpression can be oncogenic are complex, with activation of RAS-MAPK, c-jun and Akt-mTOR pathways (Figure 1). HER2 overexpression may lead to formation of HER2 homodimers and ligand-independent downstream signalling. The majority of studies investigating HER2 overexpression oncogenicity have been conducted in breast cancer, and mechanisms may differ in GOC. 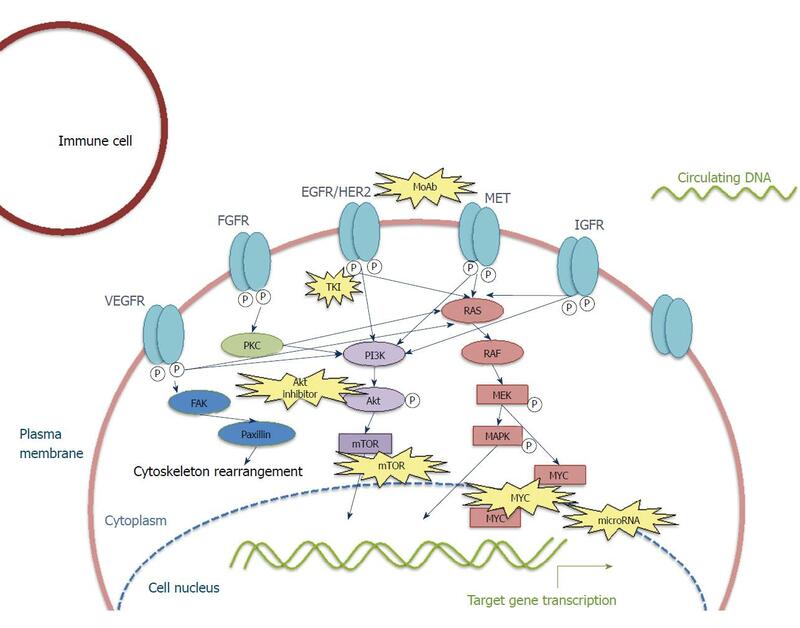 Figure 1 Simplified diagram showing signalling pathways related to human epidermal growth factor receptor 2 in gastric adenocarcinoma. VEGFR: Vascular endothelial growth factor receptor; FGFR: Fibroblast growth factor receptor; PKC: Protein kinase C; FAK: Focal adhesion kinase; HER2: Human epidermal growth factor receptor 2; MAPK: Mitogen-activated protein kinase; mTOR: Mammalian target of rapamycin. In contrast to breast cancer, HER2 overexpression does not impact survival in GOC. Large phase III prospective randomised controlled trials such as ToGA, LOGiC and TYTAN demonstrate that patients with HER2 amplified GOC who receive the control arm (chemotherapy alone) have an overall survival (OS) similar to all-comers (Table 1)[5,7-9]. In the first-line ToGA and LOGiC trials, OS was 11.1 mo and 10.5 mo, respectively, in the control arms[5,7], compared to OS in all-comers of 9.9 mo in the Phase III REAL2 trial. In the 2nd-line TYTAN trial, OS was 8.9 mo in the control[8,9], which compared favourably to OS in all-comers treated with paclitaxel in the control arms of the RAINBOW (OS 7.4 mo) and GOLD trials (OS 6.9 mo). This cross-trial comparison suggests that HER2 overexpression does not adversely affect GOC prognosis. Table 1 Summary of selected randomized phase III HER2 trials in HER2-amplified gastro-oesophageal cancer and breast cancer. HER2: Human epidermal growth factor receptor 2. The HER2 scoring system in breast cancer was developed prior to the scoring system for GOC and was standardised in 2007 following an expert panel forum. The ToGA trial used a new immunohistochemistry (IHC) scoring criteria developed by Hofmann for gastric cancer due to inherent biological differences compared to breast cancer, such as tumour heterogeneity and baso(lateral) membrane staining[5,14]. Some criteria were the same as breast cancer: HER2 positivity was defined as an IHC score of 3+ and/or erbB-2 amplification detected using fluorescent in-situ-hybridisation (FISH)[5,14]. Notably, GOC patients with highly amplified HER2 gene experience better response and survival than patients with lower HER2 gene amplification levels when treated with 1st-line trastuzumab plus chemotherapy for metastatic gastric cancer. HER2 expression in primary and metastatic sites demonstrates heterogeneity more frequently in GOC than in breast cancer[16,17], and discordance between IHC and FISH results occur more frequently in GOC than in breast cancer. This may explain the limited success of targeted anti-HER2 therapy in GOC. If only a small proportion of GOC cells shows HER2 overexpression and if our detection methods are unreliable, GOC cancer cells that do not overexpress HER2 will not be effectively targeted with anti-HER2 therapy, and we may be failing to treat adequately some patients with HER2 overexpression. The efficacy of trastuzumab (a monoclonal antibody against HER2) in breast cancer in combination with chemotherapy has been convincingly demonstrated in both metastatic (OS 25.1 mo in patients receiving trastuzumab + chemotherapy vs 20.3 mo in those receiving chemotherapy alone, Table 1) and adjuvant settings. Breast cancer OS is, however, influenced by the greater number of treatment options in the 2nd-line setting and beyond. In GOC, trastuzumab is the only licensed anti-HER2 treatment, following positive results from the ToGA trial, an open-label, international, phase 3, randomised controlled trial evaluating trastuzumab plus platinum-fluoropyrimidine chemotherapy for 1st-line treatment of HER2 positive GOC (Table 1). Median OS was initially reported as 13.8 mo (95%CI: 12-16) in patients receiving trastuzumab plus chemotherapy vs 11.1 mo (10-13) in patients receiving chemotherapy alone (HR = 0.74; 95%CI: 0.60-0.91; P = 0.0046). This led to trastuzumab plus platinum-fluoropyrimidine chemotherapy followed by trastuzumab maintenance becoming the standard of care in 1st-line metastatic GOC patients. Updated OS (after a further 1 year of follow-up) released by the United States Food and Drug Administration (FDA) in 2016 showed median OS of 13.1 mo (95%CI: 11.9-15.1) in the trastuzumab plus chemotherapy arm and 11.7 mo (95%CI: 10.3-13.0) in the control arm (HR = 0.8, 95%CI: 0.67-0.97). Subgroup analysis demonstrated that patients with IHC 3+ HER2 expression experienced the greatest benefit from trastuzumab (294 patients, HR = 0.66, 95%CI: 0.5-0.87). Patients with IHC 2+ HER2 expression gained less benefit from the addition of trastuzumab (160 patients, HR = 0.78, 95%CI: 0.55-1.10), and patients with IHC 1 or 1+ gained no benefit (133 patients, HR = 1.33, 95%CI: 0.92-1.92). Recent data on two different doses of trastuzumab in combination with chemotherapy in GOC found that a higher trastuzumab maintenance dose does not convey additional survival benefit (OS 12.5 mo in the 8 mg/kg + 6 mg/kg group vs 10.6 mo in the 8 mg/kg + 10 mg/kg group). It remains to be seen whether trastuzumab confers a survival benefit in the neo-adjuvant/perioperative/adjuvant setting in combination with chemotherapy + surgery ± radiotherapy, and several phase 2 trials are underway to address this question (UMIN 000016920, NCT01472029, NCT02250209, Table 2)[23,24]. Perioperative trastuzumab appears to be safe and well tolerated. One Phase II trial evaluating capecitabine + oxaliplatin with trastuzumab three cycles pre-operatively and post-operatively followed by 12 mo adjuvant trastuzumab reported an 18 mo DFS of 71% (95%CI: 53%-83%), a 24 mo DFS of 60% and a median follow-up of 24.1 mo (median DFS and OS not reached). Although a phase III trial evaluating radiotherapy + chemotherapy ± trastuzumab is underway (NCT01196390, Table 2), it is notable that trastuzumab is not being inve–stigated in phase III trials in the peri-operative GOC setting. This is likely due to the prohibitive number of patients (approximately 10000) that would require screening in order to recruit adequate numbers of patients for a sufficiently powered study, given that HER2 overexpression is around 20%, and a relatively small proportion of patients in Western countries are diagnosed with operable disease. Only a proportion of these patients would have an adequate performance status to enter a clinical trial; therefore, trastuzumab will likely never be investigated in phase III trials in the peri-operative setting. Table 2 Selected perioperative (neoadjuvant + adjuvant) clinical trials currently underway targeting HER2 in HER2-amplified localised gastro-oesophageal cancer. pCR: Pathological complete response; DFS: Disease-free survival. In advanced GOC, trastuzumab is being investigated in combination with bevacizumab (NCT01359397, Table 3), afatinib (NCT01522768, Table 3) and via intraperitoneal delivery (NCT01384253, Table 3). Table 3 Selected clinical trials currently underway targeting HER2 in advanced and metastatic HER2-amplified gastro-oesophageal cancer. ORR: Overall response rate; HER2: Human epidermal growth factor receptor 2. Lapatinib is an oral tyrosine kinase inhibitor targeting EGFR and HER2[7,28]. In breast cancer, lapatinib demonstrated significant clinical benefit and is now a standard line of treatment[19,29,30]. In contrast, in GOC, although it showed promise in preclinical trials, lapatinib failed to translate into clinical benefit in both 1st-line (LOGiC) and 2nd-line settings (TYTAN) (Table 1). The reasons for the disappointing results seen in GOC as compared to breast cancer may be related to lapatinib dosage, toxicities experienced, or different underlying HER2 signalling mechanisms in GOC and breast cancer. When lapatinib was combined with paclitaxel in a 1st-line breast cancer study and 2nd line GOC study (TYTAN), rates of AEs were broadly similar: 77% of patients in the lapatinib arm experienced diarrhoea in both the breast and TYTAN studies vs 29% of patients in the control arm in the breast study and 22% in the TYTAN study[8,29]. There was, however, a slightly higher rate of treatment discontinuation seen in GOC patients as compared to breast patients, with AEs resulting in treatment discontinuation in 16% in the lapatinib plus paclitaxel group vs 13% in the breast study)[8,29]. In the 1st-line GOC LOGiC trial (Table 1), there were significantly higher toxicity rates in the lapatinib arm than the control arm, with 94% of patients experiencing adverse events (AEs) and 27% serious AEs (SAEs) in the lapatinib arm vs 88% AEs and 19% SAEs in the control arm. Diarrhoea occurred in 58% of patients receiving lapatinib vs 29% in the control arm, leading to lower relative drug exposure in the lapatinib arm. Again lapatinib treatment resulted in higher rates of treatment discontinuation in GOC than breast cancer patients: 21% of patients in the lapatinib arm of LOGiC required treatment discontinuation vs 13% of breast cancer patients in the 2nd-line breast study receiving lapatinib plus capecitabine. Overall, this suggests that the chemotherapy backbone with which to combine lapatinib is important, and chemotherapy drugs with overlapping toxicity may result in lower lapatinib dose-intensity and reduced efficacy in GOC. Additionally GOC patients frequently experience gastrointestinal side-effects prior to treatment and may be less able to tolerate lapatinib treatment. Another possible reason for the poor efficacy of lapatinib in GOC is that HER2 and EGFR signalling mechanisms may differ as compared to breast cancer. Lapatinib is currently being investigated in Phase II/III trials in the peri-operative setting (STO3 trial, NCT00450203, Table 2) and as monotherapy in the advanced setting (NCT02342587, Table 3). Safety data from the STO3 trial was presented at ESMO 2016 and suggested that administration of lapatinib at a dose of 1250 mg/d in combination with ECX chemotherapy (capecitabine 1000 mg/m2) was feasible, although there was increased diarrhoea (21% in ECX + lapatinib group vs 0% in ECX group) and neutropenia (42% in ECX + lapatinib group vs 21% in ECX group), which did not appear to compromise operative management. Trastuzumab emtansine (T-DM1) is an antibody-drug conjugate that combines the HER2-targeted properties of trastuzumab with the cytotoxic activity of emtansine, enabling selective delivery of chemotherapy to HER2-overexpressing cells. Although T-DM1 demonstrated significant clinical benefit in the EMILIA breast cancer trial in the 2nd-line setting (Table 1), a similar study (GATSBY, Table 1) in GOC failed to meet its primary endpoint or any of its secondary endpoints[34,35]. It is worth noting that nearly half of the patients in the GATSBY trial were from the Asia-Pacific region. These patients are generally fit with a good performance status; and, therefore, it is likely that a significant proportion will have received post-study treatment. T-DM1 monotherapy vs T-DM1 + capecitabine is being investigated in combination with capecitabine chemotherapy in GOC in pretreated patients (NCT01702558, Table 3) and recruitment has been completed. Trastuzumab deruxtecan (DS-8201) is an antibody-drug conjugate comprising a humanised antibody against HER2 and a topoisomerase I inhibitor “payload” bound together by an enzyme-cleavable linker. A phase Iopen label dose escalation study recently presented at ASCO demonstrated an overall response rate (ORR) of 46.7% in HER2+ breast cancer patients pretreated with T-DM1 and pertuzumab and an ORR of 44.4% in gastric cancer patients pretreated with trastuzumab. This high response rate demonstrates that the “payload” bound to the anti-HER2 antibody can make a significant difference to treatment success. For the first time, similar response rates were seen in both breast and gastric cancers pretreated with HER2 inhibitors, and responses were seen even in low HER2-expressing tumours. Results of the currently planned phase 2 trials are eagerly awaited (NCT02564900, Table 3), and whether these response rates can translate into improved overall survival remains to be seen. Pertuzumab is a humanised monoclonal antibody targeting a different HER2 epitope to trastuzumab, preventing formation of HER2-HER3 heterodimers. It can be administered concurrently with trastuzumab. In the CLEOPATRA breast cancer study, pertuzumab demonstrated significant clinical benefit when added to trastuzumab plus taxane chemotherapy. Disappointingly, in advanced GOC, the phase III JACOB study of pertuzumab + trastuzumab failed to demonstrate a significant improvement in OS. Pertuzumab is currently being explored in combination with trastuzumab and chemotherapy in the perioperative GOC setting in INNOVATION (NCT02205047) and PETRARCA trials (NCT02581462) and with the addition of radiotherapy in the TRAP trial (NCT02120911) (Table 2). Preclinical studies investigating pertuzumab in combination with T-DM1 in GOC cell lines and xenograft models found this combination caused growth inhibition but no tumour shrinkage. A literature search did not reveal any clinical studies investigating this combination in GOC. MM-111 is a bispecific antibody fusion protein designed by Merrimack to inhibit HER3-ligand binding and signalling in HER2-amplified tumours by preventing formation of HER2-HER3 heterodimers[43,44]. Preclinical studies showed promise, leading to phase 1 and phase 2 studies in selected tumour types, including HER2-amplified breast and GOC[43,44]. However, the phase 2 study investigating MM-111 in HER2-amplified GOC patients was terminated early by the independent data monitoring committee when it was found that the addition of MM-111 to chemotherapy + trastuzumab resulted in a significantly poorer PFS and OS. In light of the disappointing results seen in GOC, all further studies investigating MM-111 were withdrawn, and Merrimack announced that it does not plan to invest further in MM-111. Poziotinib is an oral pan-HER2 inhibitor whose role in combination with trastuzumab and paclitaxel is currently under investigation in advanced gastric cancer (NCT01746771, Table 3). Phase 1 studies in GOC are investigating MGAH22 (Margetuximab) (NCT01148849, Table 3), a chimeric anti-HER2 monoclonal antibody similar to trastuzumab but engineered for increased binding. Medimmune is investigating their HER2 inhibitor, MEDI4276, in a Phase 1 trial (NCT02576548, Table 3) in both breast and gastric cancers. Pyrotinib is an oral tyrosine kinase inhibitor targeting both HER1 (EGFR) and HER2 and is currently being explored in phase 1 trials in GOC (NCT02378389, NCT02500199, Table 3). Resistance to HER2 therapy can be one of two types: primary (intrinsic) resistance occurs when there is no response to HER2 inhibitors and secondary (acquired) resistance occurs when there is an initial response followed by cessation of response. Differentiating between these types of resistance is important, as it dictates the optimal timing of treatment strategies. p95HER2: An aminotruncated form of HER2, known as p95HER2, lacks the region to which trastuzumab binds and is expressed in 20%-37% of breast cancer patients and 60%-77% of GOC patients with HER2 amplified disease[48,49]. This may partly explain the poorer response to trastuzumab in GOC as compared to breast cancer. HER2 mutation: Within the TCGA, 15 cases of ERBB2 mutation in GOC were detected using RNA evidence out of 215 non-hypermutated tumours. Evaluation of HER2 mutation across an array of tumour types revealed HER2 mutations in around 5% of gastric cancer patients. Neratinib, a pan-HER tyrosine kinase inhibitor, is being explored in HER2-mutated cancer (NCT01953926, Table 3). A recent study presented at ASCO found that 35% of GOC treated with trastuzumab lost HER2 positivity. Similarly, in breast cancer, loss of HER2 positivity has been reported in patients treated with neoadjuvant trastuzumab + chemotherapy or chemotherapy alone, and loss of HER2 positivity was associated with an increased risk of disease relapse. PIK3CA/PTEN/PI3K/AKT/mTOR pathway: The antitumour activity of HER2 inhibitors requires downstream inhibition of PI3K/AKT[46,53]. BOLERO-3 was a randomised, double-blind, placebo-controlled phase 3 trial in HER2 positive, trastuzumab-resistant, advanced previously-treated breast cancer patients that explored whether the mTOR inhibitor everolimus might restore sensitivity to trastuzumab. It demonstrated significant improvement in PFS with the addition of everolimus [7 mo (95%CI: 6.74-8.18) in the everolimus group vs 5.78 mo (5.49-6.9) in the placebo group]. The randomised phase 3 BOLERO-1 trial compared everolimus plus trastuzumab plus paclitaxel to placebo plus trastuzumab plus paclitaxel in order to assess whether addition of everolimus at treatment outset might prevent intrinsic resistance: primary endpoint (PFS) was not met. Phase 3 clinical trials have not been conducted specifically in HER2 positive GOC patients. The phase 3 GRANITE trial randomised 656 patients with advanced pretreated gastric cancer to either everolimus or matching placebo. HER2 status was not an inclusion or exclusion criteria, and we do not know the percentage of HER2 positive patients within this trial. The primary endpoint (OS) was not met, and everolimus was associated with significant side-effects: 21.5% of patients receiving everolimus required drug discontinuation and 55.4% required dose adjustments/interruptions. Such high rates of adverse events are concerning in the palliative setting, where quality of life is important. Insulin-like growth factor-1 receptor (IGF-1R) is involved in acquired resistance to HER2 blockade in breast cancer[46,57] and GOC cells in vitro by forming heterodimers with HER2. Blockade of this heterodimer formation in vitro and in vivo restored sensitivity to HER2, and combination studies of HER2 blockade in combination with IGF-1R inhibitors were more effective than either agent alone. Clinical studies exploring IGF-1R inhibitors in combination with HER2 inhibitors in breast cancer patients found no significant difference in PFS (NCT00684983); other studies evaluating this strategy were withdrawn, and there are no GOC studies. Clinical studies of MET inhibitors as monotherapy in HER2 negative breast cancer patients did not meet their primary endpoint[49,60]. In GOC, a randomized double-blind phase 3 clinical trial exploring MET inhibition in HER2 negative, MET positive GOC patients found no benefit from the addition of the MET inhibitor onartuzumab to chemotherapy. Phase 2 results for an alternative MET inhibitor, tivatinib, similarly showed no survival advantage. In light of these disappointing results, it is unlikely MET inhibition will be explored in the clinical setting in HER2-overexpressing breast or GOC patients. Combining HER2- and Heat shock protein (HSP90)-inhibition to overcome resistance to HER2 inhibitors showed promise preclinically in cell lines and mouse models in breast and GOC cell lines. However, a phase 2 study in breast cancer has not yet released results, and a phase 2 study in gastric cancer was terminated (NCT01402401). MicroRNAs (miRs) are small non-coding RNAs that control gene expression through messenger RNA degradation and post-transcriptional inhibition. MiRs are tissue-specific, and different microRNA signatures may occur during resistance to HER2 inhibition in breast and GOC. In HER2 positive breast and gastric cancer cells, miR-21 overexpression leads to PTEN downregulation, suppression of trastuzumab-induced apoptosis and increased trastuzumab resistance[66,67]. MiRNA-542-3p downregulation promotes trastuzumab resistance in breast cancer via AKT activation. MiR-7 functions as a suppressor of the oncogenic isoform of HER2, HER2Δ16, and reverses HER2Δ16-induced trastuzumab resistance in breast cancer. The use of miRs not only as biomarkers but as targets for anticancer therapy may allow new therapeutic miR silencing in the future. Inhibition of certain microRNAs may also enhance the effect of HER2 inhibition. Natural killer (NK) cells are required in order to exert trastuzumab’s therapeutic effect. Mice deficient in NK cells show trastuzumab resistance and when numbers of innate and adaptive immune cells in the tumour microenvironment increase, there is increased tumour eradication. Trials studying the immune environment in GOC are underway (NCT02318901, NCT01526473, NCT02276300, Table 3). Specific-uptake positron emission tomography (PET) scans: Targeted PET scans using radiolabelled trastuzumab (89Zr-Trastuzumab) to demonstrate HER2 uptake can give real-time information on HER2 expression levels, visually displaying the development of resistance with the advantage of being relatively non-invasive and, therefore, preferable for patients. Circulating DNA: Circulating DNA may represent a clinically useful biomarker that reduces the need for invasive biopsies. Plasma DNA digital PCR can detect HER2 status in metastatic breast cancer patients. A systematic review and meta-analysis has suggested that serum HER2 is a potential surrogate for tissue HER2 status in gastric cancer. Despite numerous HER2 inhibitors being investigated in a number of settings, trastuzumab in advanced disease is still the only HER2 inhibitor licensed for clinical use in the treatment of GOC. Even within this setting, the overall survival benefit is far less than that seen in breast cancer. Other HER2 inhibitors that have demonstrated success in breast cancer have failed to reach statistically significant endpoints in GOC clinical trials, and it remains to be seen whether clinical trials currently underway will show improved results. HER2 heterogeneity, amino-truncation loss of HER2 expression and differences in signalling pathways may contribute to the disappointing clinical trial outcomes seen in GOC. Different microRNA signatures and immune environments are also likely to play a role. Development of new HER2 inhibition strategies in conjunction with further research into how the role of HER2 differs in GOC as compared to breast cancer is required. Clinical trials utilizing biomarkers such as specific uptake PET scans and circulating DNA may provide early insight into whether patients are responding to HER2 inhibition. Only with improved understanding of HER2 inhibition in GOC can effective treatment be provided in order to improve clinical outcomes for patients.